SLEEP IN COMFORT - this topper is designed just like the memory foam toppers on adult beds to provide contouring comfort that's soft and soothing on tiny bodies and reduces tossing and turning so your little one can get a better night sleep - and you can too! WATERPROOF COVER - Comes with a top-quality, hypoallergenic cover that's both waterproof and washable so you can rest easy knowing your topper is protected from spills and other nighttime accidents. QUALITY THAT LASTS - constructed of 2-inch-thick, luxurious, 100% memory foam with a premium 2.5 lb. density so your topper can last for years without losing shape. Aerating holes are carefully added to each topper to increase ventilation while your child sleeps. 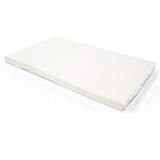 SAFETY FIRST - Foam topper is CertiPUR-US certified for your child's safety and the included cover is hypoallergenic, so you can rest in the knowledge that you are providing a comfortable and safe sleep environment for your child. MORE DETAILS - Soft topper is not intended for babies. Consult with physician for safety recommendations. Topper measures. 52" x 27" x 2". Please allow 24 to 48 hours for foam to expand after opening.